A favorite color combination of mine will always be pinks and whites with tans. 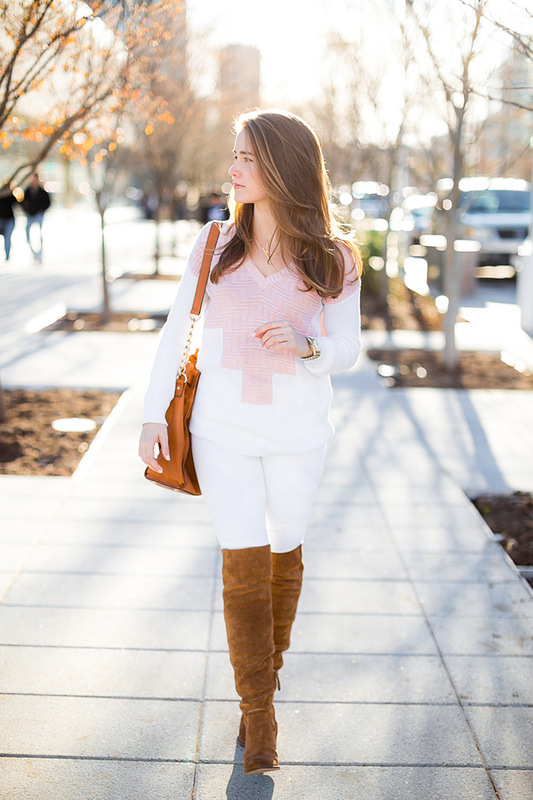 There’s something timelessly feminine, warm and friendly about the mix that I simply can’t get enough of! As we head into the coldest months of the year, I find myself reaching for these bright, light tones to counteract the dreary weather and usher in a teeny tiny bit of spring. And this cozy sweater made that all too easy. Apart from coming in my favorite shades (it’s also available in black/white) the cool color block design sets it way ahead of the pack! 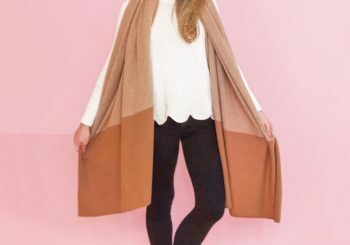 I sometimes get bored with the constant flow of solid color sweaters (although I have a few I love) and this unique beauty was just what I needed to add some pep into my winter closet. At under $100, it’s a piece you’ll look forward to pulling out winter after winter. 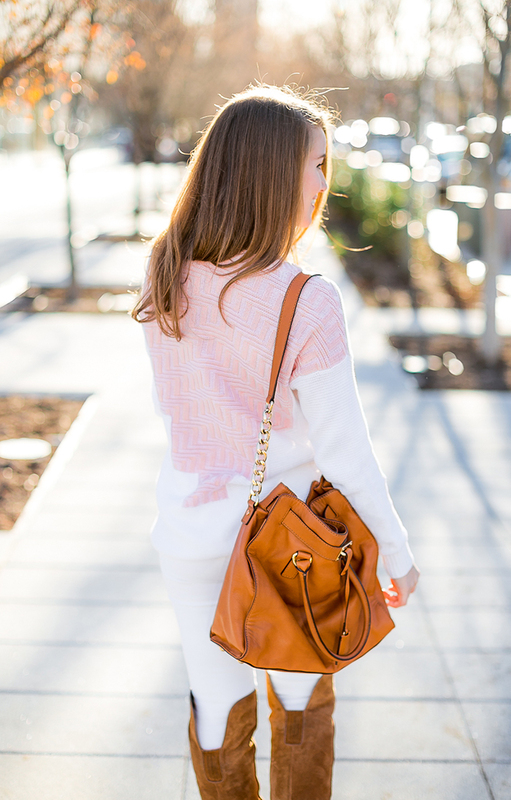 Those select sweaters that stand the test of time are always my favorite buys! My apologies for the late post today, y’all. I could not get up this morning! I usually look forward to jumping into the week on Monday mornings, but my body had other ideas today. It’s been a slow start, but after a cup of coffee (with two hazelnut creamers, of course) I’m feeling ready to pick up the pace. Let’s do this! *I had the change to work with Taylor of Dallastyle for the first time this weekend, and she is incredible! Thanks for these fun images, Taylor! 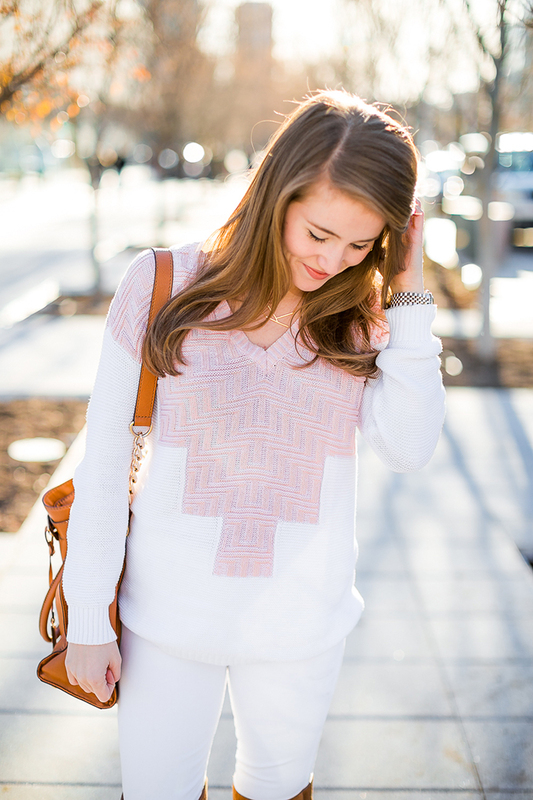 Super cute sweater, love the pattern! Love the sweater! I just simply love the color combination of this outfit. Gorgeous, Kate! Loving the pattern of that sweater!! 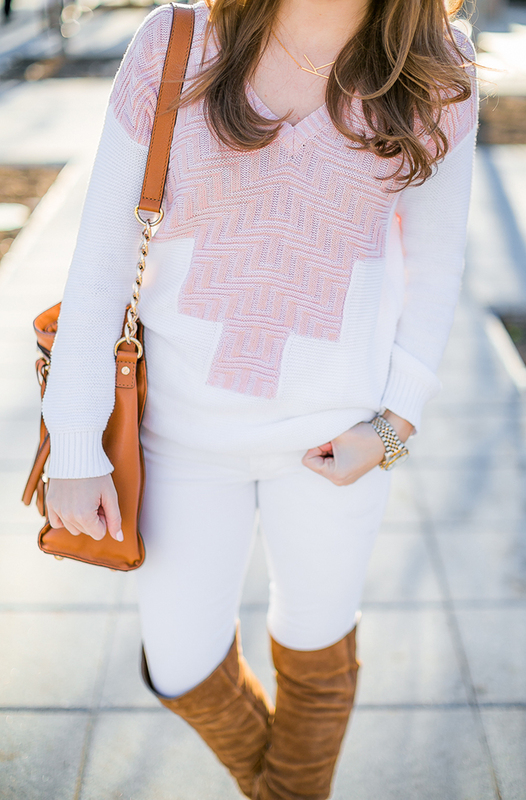 I love the pink details on your sweater! So cute. This outfit is so cute, Kate! I love the light colors! Every time you put up a new post I always think could her photos get anymore gloriously bright?! You’ve done it again! 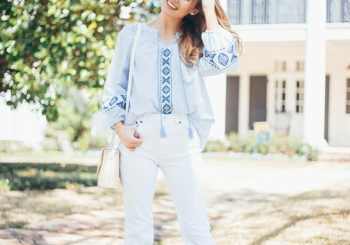 Love this whole look! Especially that initial necklace, looks so pretty with your pink sweater! Yes this sweater is definitely cute.